It is a 2.4 GHz Wi-Fi 802.11 b/g/n based on Cypress CYW43362 Radio, St Micro STM32F205 microcontroller with 1 Meg of Flash and antenna. 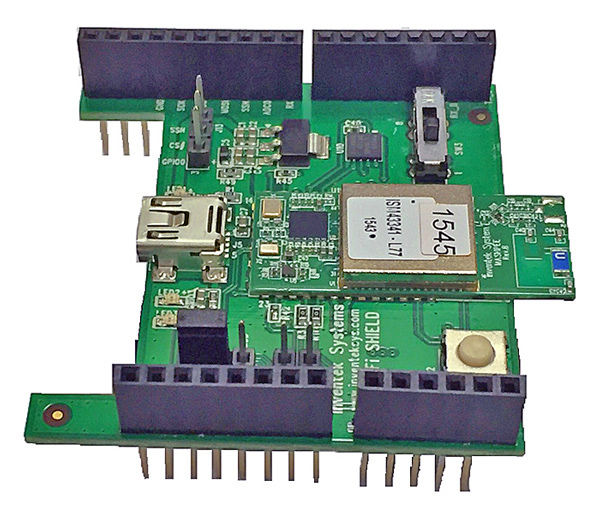 The ISMART shield is an embedded wireless internet connectivity platform for IoT development. 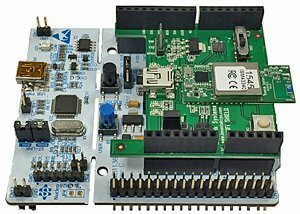 It can be used as a stand alone development board running Inventek IWIN: AT commands software or Cypress WICED SDK. The ISMART boards plug into a variety of microcontrollers shields, such as ST Micro, Cypress PSOC, Analog Devices, Intel and others. Sample projects are available in IWN Support (IWIN – MCU reference designs). The shield is compatible with the Arduino UNO R3 3.3V connector layout (without software support for Arduino). The Wi-Fi module requires no operating system and contains an integrated TCP/IP stack running on the module core. The module hardware can be used with Inventek’s AT Command set (IWIN) or with Cypress WICEDTM SDK. 2.4GHz Etched antenna on module. Configurable using Inventek AT Commands FW (IWIN). Dual Port FTDI for firmware development and testing. FCC, IC and CE and Japan approval . All eS-WiFi module options also support a standard L44 or L54 form factor to enable customers to migrate between module options once in mass production without requiring any board layout changes.